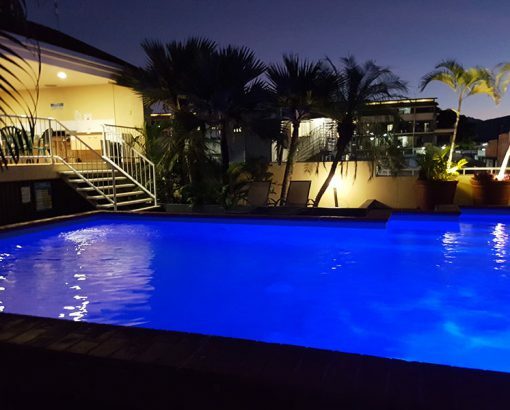 It’s important to us that you have a memorable stay when you visit Cairns and Inn Cairns Boutique Apartments has a lot of features that will help you make the most of your visit to the Tropics. The complex features internal atriums and several outdoor spaces that are perfect for gathering together with fellow guests and enjoying our wonderful climate and rooftop views across the city. Our expansive rooftop terrace is one of our most unique features. With 360 degree views across the city and the surrounding hills by day and by night. Whether you want to watch the sunrise with a tropical breakfast or enjoy the amazing colours of a sunset at the end of a busy day, this terrace is a hidden gem. The pool area, with its weather-proof gazebo and BBQ facilities, offers guests another way to make the most of their tropical holiday. Lounge seating and seclusion from the busy city make this the perfect spot in which to cool down from the heat of the day. In a rare touch for city centre accommodation, we offer all our guests FREE secure parking. Fully undercover and split across two levels, this feature allows you to make the most of exploring the region by bringing or hiring a car (through us) but avoids any stress or costs associated with street parking. 2.3m clearance on the ground floor caters for most 4WD vehicles and vans. We provide FREE Wi-Fi access to our guests. We offer 24 hour check in with easy night service access for those arriving after hours. During business hours, our staff are always on site to help and are available to give you the best tips on how best to make the most of your stay. While your apartment has everything you need to be able to cook a great meal for yourself, staying at Inn Cairns Boutique Apartments is even easier thanks to our direct access to a whole host of eating options such as Thai, Vietnamese, Indian, Japanese, Mexican, Jaffles, Pancakes, Kababs, Vegetarian and the good ole pub meal to name just a few! Directly across the street is a food court, major supermarket and bottle shop.